This mornings meeting (Edinburgh Coffee Morning) was a sell out thanks to Ewan inviting along some of his teaching/blogging colleagues. 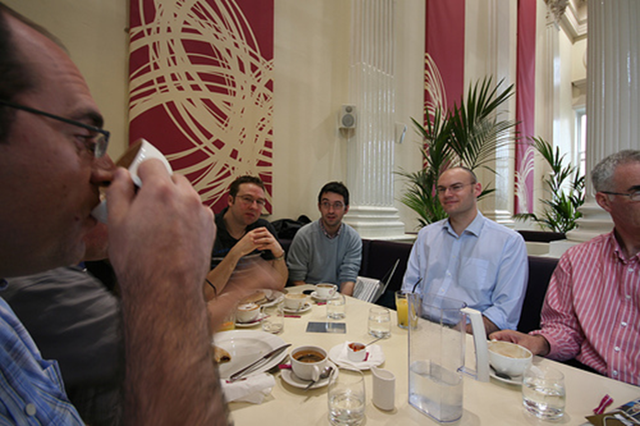 Meeting Mark (Drinking coffee to the left of the picture) of the infamous Spanish Coffee Break podcast series, I think its been number one in the charts in the past year. And Ewan embarrassing me by putting me on the spot to demo 3D desktop effects in Ubuntu, generally not talking much sense. 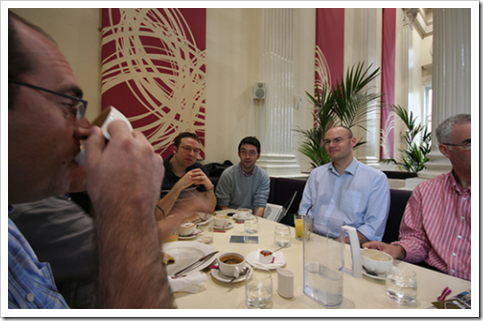 Edinburgh Coffee Morning – Friday the 13th! I have never seen the Ubuntu 3D effects demoed. Pretty amazing stuff. Isn’t Apple releasing a similar feature with Leopard? I think it’s called Spaces. Not being a Apple guy I couldn’t say for sure. I did hear something once about Mac’s getting virtual desktops, so I suppose it would make sense to have a cool animation when switching between them. Yeah it looks good, but it also helps the user to visualise it in their mind? i receive 130$ every month doing nothing, there is just 4 links at my website)))And you’re website is much more better then mine. No matter what language your website or blog has. No matter how many visitors a day visit your website, it’s only depends on the PR! You can find several good tips at my blog.